If you are interested in storing your household or business belongings, My Guys Moving & Storage can handle every aspect of the task from packing, loading, and storing your items for as long as you need. If you have any special requirements, just let us know and we'll tailor a relocation solution specifically for you. Whether you're considering a local move or relocating across the county, we will take the worry out of your move. Keep in mind that if you are moving 31 miles or more within Virginia, please review "Making a Better Move in Virginia" or request a copy from the Virginia Movers & Warehousemen’s Association. More Trucks and More Guys - Get My Guys on it! We have more than 30 trucks and over 100 professional local movers who are waiting to help with your move for your home or office. We offer packing and unpacking for our customers in order to alleviate many of the stresses of moving to a new location. We also offer long- and short-term storage, government services, international shipping, and much more. 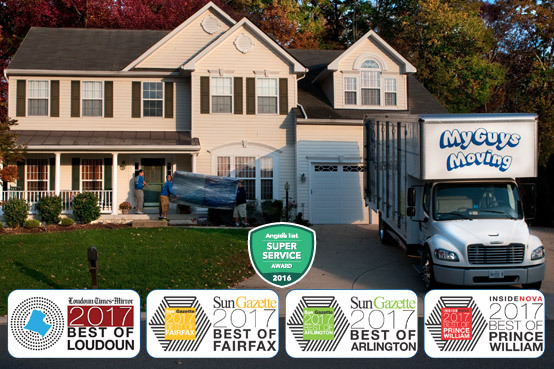 We are able to do more for our customers than most long distance or local moving companies in Northern VA.
For five years in a row, My Guys Moving & Storage was voted one of the Best Moving Companies in Northern VA for 2013-2017 by Loudoun Times-Mirror, Sun Gazette and Prince William Today. We won Angie's List Super Service Award in 2011-2016, and we maintain an A+ Rating as an Accredited Better Business Bureau (BBB) Member. You can check out our reviews on Yelp, Google and Facebook, and book a FREE estimate by calling us at 703-406-9605. "Josh and his team were fantastic. They took excellent care of protecting the home during the move. They also wanted to ensure we weee very satisfied with the placement of all items. I’ve moved 9 times, and would rate My Guys as a top mover. I would recommend you, and I would definitely use you again." "Solis and Tony were fantastic ... courteous, careful, efficient, hard-working, friendly, helpful, polite, thoughtful. It was a pleasure working with them." We offer the best training for our movers: Northern VA is a bustling area, and we make sure that our service keeps up with it. We have a simulated townhouse where we train our movers on a regular basis. My Guys is ready to handle all situations that may arise on a long distance or local move. We are licensed, bonded, and insured and can offer high-valuation coverage. Our professional movers are considerate of HOA guidelines, and we are well-rated by the Better Business Bureau. And My Guys movers are always willing to make special accomodations and additional stops when necessary. We offer the best service at affordable prices to anyone who needs movers. Northern VA is where we got our start, and we serve Arlington County, Alexandria County, Fairfax County, Loudoun County, Fauquier County, Prince William County, and surrounding towns, neighborhoods, and communities with pride. We are one of the best moving companies Northern VA has to offer, and all of our potential customers, whether they are residential or commercial, can get a free estimate online by filling out our simple form. We have no hidden fees, and there will be no unexplained charges. We also have moving boxes and packing supplies at affordable prices. And all of our equipment, pads, and trucks are kept clean and in great condition to take the best care of your furnishings. "They were a great help on moving day and I was so impressed by how quickly the team moved, how respectful they were of all my belongings and our new home with it's brand new carpet (which they carefully covered before walking on). They wrapped and covered all of my furniture and TV and computer before transporting them to ensure they were delivered without any damage. Everyone involved was very professional and courteous. It was sleeting by the time we arrived at my new home and everyone working remained cheerful and helpful despite the awful weather. The team was amazing and adapted well to the situation. Overall I had an excellent experience and am so glad that out of all the moving companies in Northern VA I opted to hire My Guys!" "I cannot tell you enough what great movers Javier and Jose are. You can see they take pride in their work. They took care of protecting everything. They are so polite. I hope if I move again, that they are available to move my household goods. This is my family’s third move with my guys moving and I wouldn’t have anyone else move us." Call 703-406-9605 • 800-783-4897 or simply fill out the Free Moving Quote and One of the Guys will be right with you. Thanks for contacting MY GUYS, your reliable mover for all of Northern Virginia.